Last night my husband and I watched 'Invictus'. It was thought provoking and inspirational. I highly recommend it. 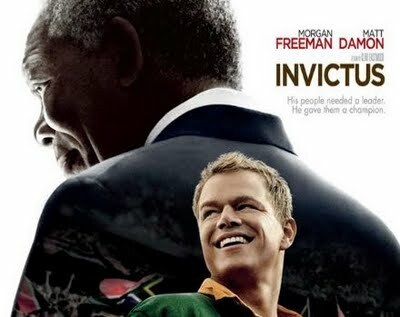 'Invictus' tells the inspiring true story of how Nelson Mandela (Morgan Freeman) joined forces with the captain of South Africa's rugby team, Francois Pienaar (Matt Damon), to help unite their country. The word Invictus is Latin for unconquered. The movie is titled 'Invictus' after a poem written by William Ernest Henley. A poem that gave Nelson Mandela strength and hope during his 30 year unjust incarceration. As a writer and lover of poetry, I think this is one of my new favorites. I give thanks to God daily, for my own unconquerable soul! Thank you for the poem and the movie recommendation! A very timely poem with our youth's activity theme is: "Be Strong & of Good Courage." My husband and I watched that the other day too. Very good. Very inspiring. This movie is one of Kye and myself's favorites. Very inspirational. I am glad you wrote down that poem because I have wanted to get it! So thanks!